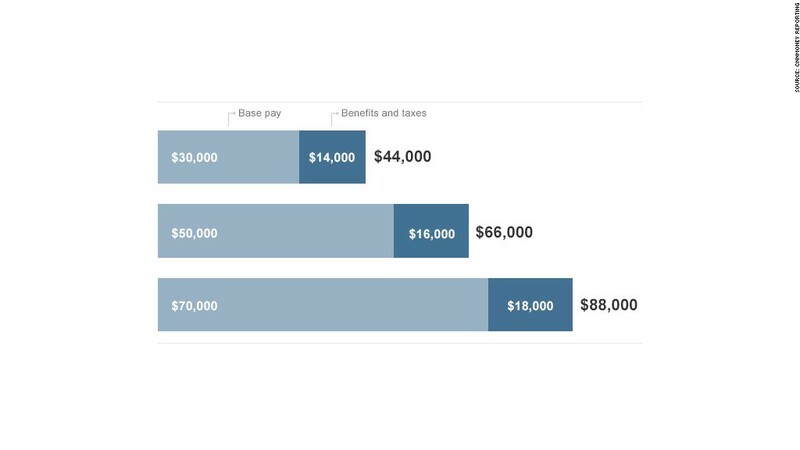 While that depends on benefits -- and several layers of taxes -- it typically ends up being 18% to 26% more than a worker's base salary. It can be even higher for larger companies. Anytime that Tony Knopp needs to calculate the cost of an employee, he adds another 20% to their salary. The CEO of Spotlight Ticket Management in Los Angeles said staffers "don't understand how much we are investing in them." "Many see the salary and assume that is the number. It's not," he said. That's especially true for new employees who need training. They cost Knopp half a year's salary by the time they start producing. Here's a breakdown of the implicit costs considered by few but the boss. Let's assume a base annual salary of $70,000. Workers pay an identical tax, and those combined funds contribute to the nation's Social Security system. This is the second part of the employer's payroll tax, and it contributes to the nation's Medicare system. Bosses owe the federal government 1.45% of their workers' earnings no matter how high those salaries are. But the rules are different in every state. Tennessee's unemployment insurance rate for new companies can reach as high as 9.1%, and Washington State has the highest taxable wage cap at $39,800. Older businesses are subject to even higher unemployment rates, like Pennsylvania's 15% or Massachusetts' 12.3%. This is by far the highest expense for any boss, and it's one that most small businesses don't skimp on. Last year, 84% of small businesses covered some or all of their workers' health care premiums for family coverage plans. In this case, small businesses are defined as those with fewer than 200 employees. On average, employers last year contributed $10,119 to each employee's $15,253 family coverage premium. It's less expensive for bosses to cover single employees. On average last year, they contributed $4,740 to each worker's annual $5,588 single coverage premium. Retirement plans are another expense that can vary depending on the business owner's preferences and the plan they choose. The average company contribution in 401(k) plans is 2.5% of an worker's salary, according to researchers at the nonprofit Plan Sponsor Council of America. However, that only counts the employer's contributions to each plan. It doesn't include the cost of adopting the program itself, which the employer bears as well. But small businesses are increasingly under pressure to compete with larger ones, which means they have to offer matching benefits.